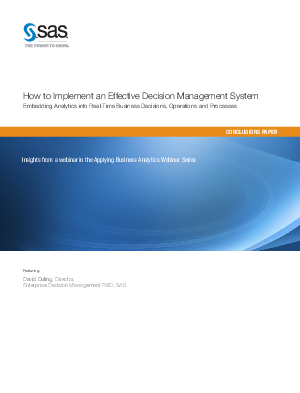 Once used mostly in traditional batch-type environments, analytic techniques are now being embedded into real-time business decisions, operations and processes. In fact, decision support insight should be embedded very consistently in operational systems. • When a credit card organization is processing a card swipe, fraud detection analytics should be embedded in that process. • When analysis of sensor data over time indicates an impending problem with a mechanical process, utility grid or manufacturing system, the system should trigger some proactive intervention. • When call center agents have a customer on the phone, or tellers have a customer at the counter, analytics behind the scenes should be giving them the informationthey need to customize the interaction – right now. This ideal has historically been a challenge to implement because the niche applications used for different business functions have not been on great speaking terms. Unlike niche tools, an enterprise decision management framework extracts information from multiple sources, runs it through analytical processes, and delivers the results directly into business applications or operational systems. To lean more download this whitepaper.